Hello Everyone! We are so excited to be the ones to kick off this fun "Fall Fever" celebration! 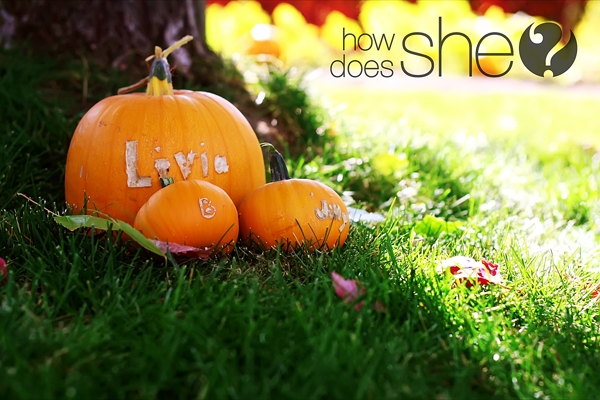 Just to introduce us a little...we are HowDoesShe? We are a site dedicated to finding out "How Does She?" 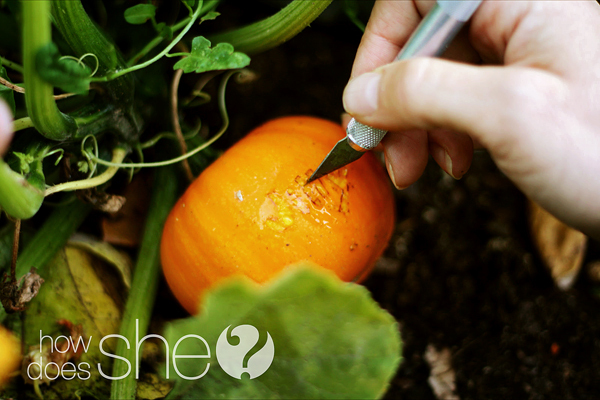 by collaborating ideas on how to be the mothers, wives, and world-class women we want to be! 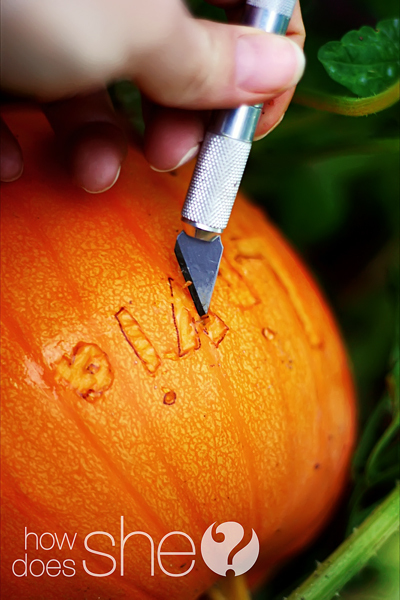 We especially love this time of year and are very excited to share a new twist to traditional pumpkin carving: Pumpkin Scarring. When we moved into the house we are in now, the previous owners had some sweet little girls who'd been working hard on their pumpkin garden. They had plans to have a pumpkin selling stand on the corner near Halloween. They needed to make some money:) When they left, they asked us to take care of thier pumpkins and make sure they were watered. ...add a little stress to the move. Not only keep plants alive, but to help them grow too? HA! It's a good thing they are pumpkins and you don't have to do too much! with her kids one year and I should try it too. I'd never heard of it so why not try? 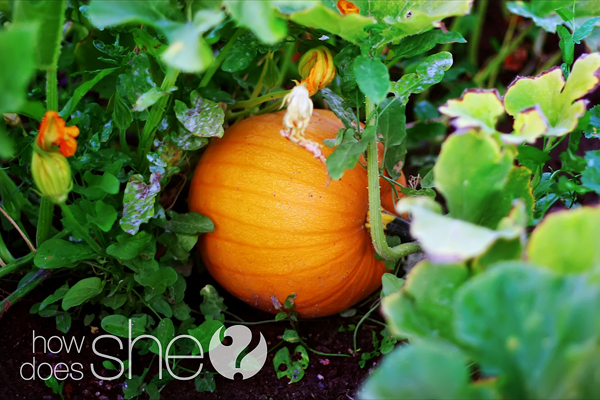 Pumpkin scarring is when you take the top layer of pumpkin skin off when the pumpkin is small and while the pumpkin grows the 'scar' will grow as well. One of the little girls who 'owned' this pumpkin patch was named Jilly, I tried it out on her's. Take an exact-o knife and cut around the letters. Not too deep. Just a little. See the thin layer that is peeled off? Keep it thin. Then let the month or month(s) roll by...and tada! One scarred pumpkin that has a name in it. 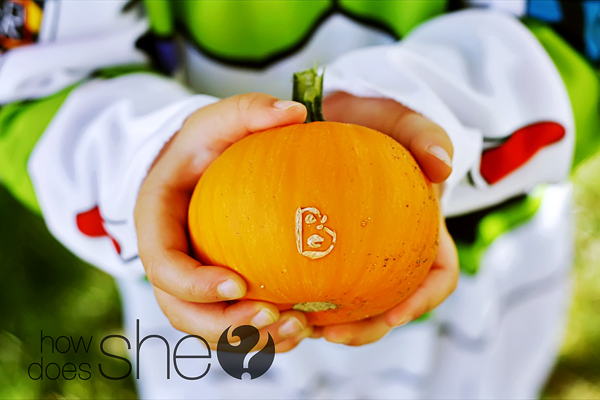 This pumpkin is claimed by 'B' aka Ben. 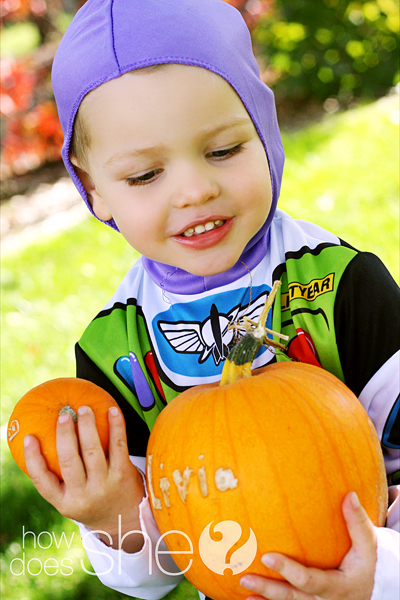 My little Buzz light year was so excited to take these to our Halloween party and give Livia, Ben and Jilly their pumpkins. It worked out great and next year my girls want to make sure to scar their pumpkins! 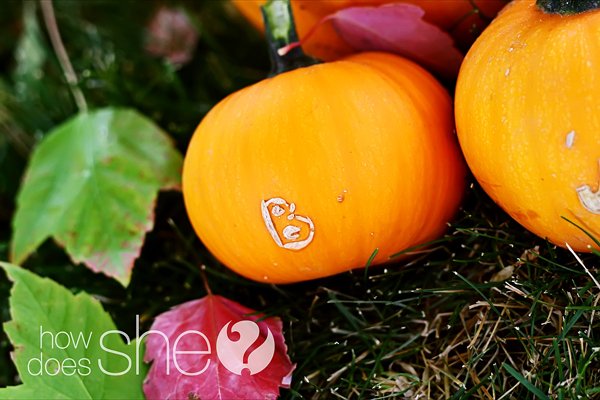 Cute way to decorate a pumpkin non jack-o-lantern style so they can stay out through Thanksgiving! Aren't these ladies darling and what a great idea! 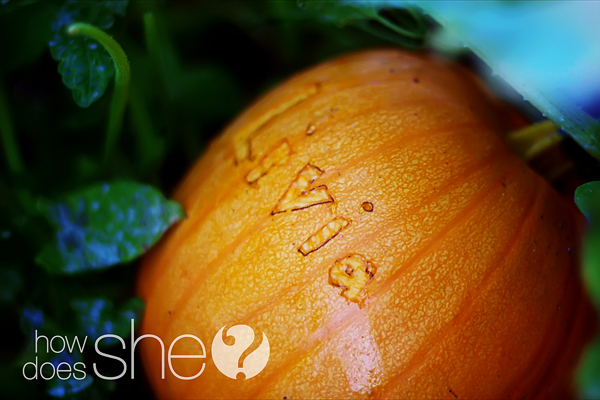 You still have 2 months until Halloween - Run out to your gardens and get scarring those pumpkins!! Also, remember to come back tomorrow - the Crafting Chicks are going to be here!! We have done this for the past 4 years at our house. We love it! It is so fun.